Lori Harvey is an American model and a popular internet personality. She is the step-daughter of popular American comedian, television host, producer, radio personality, actor, and author Steve Harvey. She is more popular on Instagram and has over 1 million followers on her Instagram account. She is a former Equestrian. She began her modeling career in 2017. 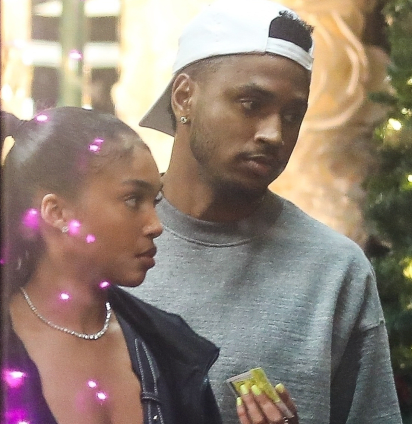 As rumors are flowing around about the secret affairs between Lori and Trey Songz, an adult film actress Brittney Jones has claimed she has been dating him for a while making a love triangle of three. She has come forward with strong evidence that Trey and she has been dating for a while and had no clue about the involvement of another girl. Jones shared her side of the story via social media posting screenshots and video clips of messages claiming Trey has been hitting on her. She explained, "Trey Songs was into me because we are both sick and twisted and he wanted to do some sick things with me. Things other women are ashamed to say out loud." Trey Songz recently posted an Instagram photo with a mystery woman's foot. Many believed the woman as Lori. Lori Harvey was born on 13 January 1997. American comedian, Steve Harvey is her step-father and Marjorie Harvey is her mother. Her mother is a fashion designer, blogger, stylist, and also an internet personality. Donnell Woods is her biological father. After the split, Marjorie met Steve. They got married in 2007. She was born in Memphis, Tennessee in the United States. She holds American nationality. She has two biological brothers, Morgan and Jason. She also has two half-brothers, Broderick Harvey Jr. and Wynton, and two-half sisters, Brandi and Karli, from his father's previous two marriages. Her zodiac sign is Capricorn. She follows Christianity. She grew up in Atlanta and attended Atlanta High School in Georgia. Lori Harvey dreamt of becoming an Equestrian growing up. She is an Olimpic medal winner. She has bagged several Equestrian competitions medals during her Equestrian career. In 2015, she met an accident while riding a horse in Lexington, Kentucky. The accident ended her Equestrian career. She pursued her career in modeling. Earlier, she has appeared as a child model for several advertisements. She has modeling contracts signed with LA Models in USA and Select Model Management in Europe. She has ramp walked at "Paris and Milan Fashion Week", "Dolce and Gabbana" and Met Gala". She is unmarried. Currently, she is reportedly dating an American rapper, Trey Songz. Previously, she was romantically linked with football player Memphis Depay. It was announced in June 2017 that they got engaged. They split later. She has a pet dog and a horse. She lives in Los Angeles, California at present. Lori Harvey stands at a height of 1.6 m i.e. 5 feet and 3 inches tall. She has a body weight of 121 lbs i.e. 55 kg. She wears a bra of size 33B. Her body measurements are 34-24-35 inches. She wears a shoe of size 6 (US). She has brown eyes and her hair color is black. She is a model and an Instagram star. She has been making decent earning form modeling projects and sponsorships. Her net worth is estimated at around $640,000, as of 2018.
she is often seen with a chimp, tiger cub, and cheetah on her Instagram pictures. she often spends her spare time traveling to the new places.